The Mandala is yet another interesting way to express what is going on inside of me at the moment. I chose to create a mandala expressing my love for spring because all I can think about is how wonderful the weather will be in a few months. This was an assignment in my play therapy class. The orange flower in the middle signifies my love for the color orange, spring, fresh flowers and nature in general. 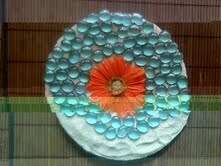 The crystal blue rocks represent peace, serenity, blue skies and the ocean that awaits me in a few weeks. I also sprinkled sand throughout my mandala because I am the happiest when I’m at the beach. I thoroughly enjoyed creating my spring mandala. This was another great introspective assignment. I could have gone in so many directions with this assignment because I have so much going on in my life right now. However, the beauty and anticipation of spring is the most prominent theme for me this week. I love all things orange and all things spring. If I had more time, I would have added flip flops, sundresses, baseball, and ice cream.